Whenever I work in Finder, I want two windows open side-by-side, nearly filling the screen. Although it’s not hard to set this up, it takes some fiddling and the windows do not stay as I want them for long. I have always wanted a button that would arrange them for me with one click. Mario Leonti is now offering this button in the form of a $0.99 AppleScript-based application called Fiwi. I put it in the Dock, I click on it instead of the Finder, and voila! My windows go just where I want them to. The application quits immediately afterward. A tiny product with enormous utility. Before I put Fiwi in the Dock, I renamed it “FiwiC”. Adding the “C” tells Fiwi to arrange the windows side-by-side, in columns. 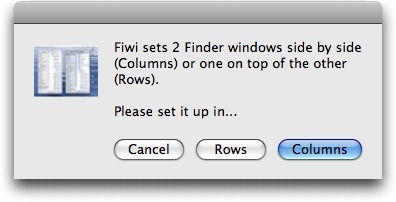 Renaming it “FiwiR” tells Fiwi to arrange the windows in vertically stacked rows. With its original name, Fiwi lets you choose between side-by-side and stacked windows. Fiwi is an 84K download, and you can use it 99 times in demo mode to make sure it’s something you’ll find useful before buying.